Sometimes a cloudy day gives you more options. 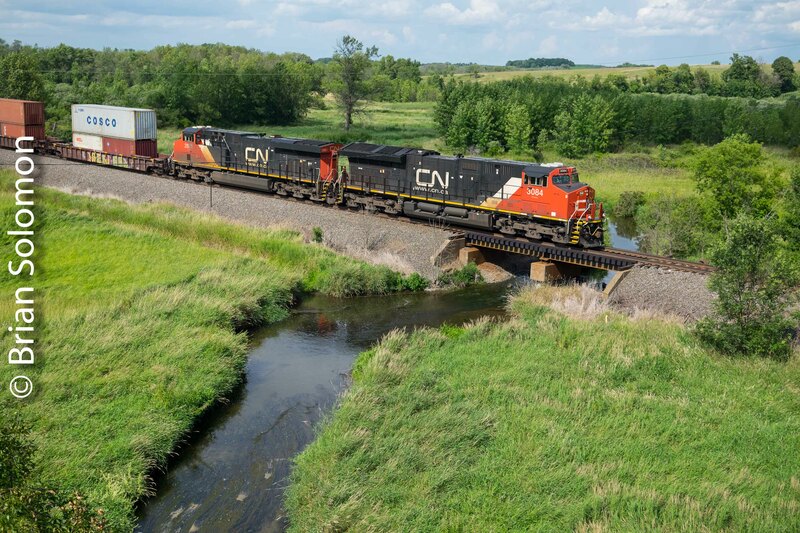 If the sun had been out, Hillside Road in Ackerville, Wisconsin may not have been the preferred mid-morning location to catch this northward Canadian National double-stack train. Brian Schmidt and I caught three trains here on Saturday, January 19, 2019. I made this view using my FujiFilm XT1 fitted with an 18-135mm Fujinon zoom lens. You’ll need to pay close attention to figure out the players in this scenario. Duplainville, Wisconsin is where the former Milwaukee Road mainline to the Twin Cities from its namesake crosses the historic Soo Line/Wisconsin Central route between Chicago and Fond du Lac. Soo Line bought the Milwaukee in the 1980s, and in the 1990s the Soo Line branding was displaced by parent Canadian Pacific, which is now CP Rail. In the late 1980s, Wisconsin Central Limited took over the old Soo Line route and operated this until bought up by Canadian National in 2001. This led to confusing situation in the mid 1990s where the old Soo Line was the WCL, and the ‘New Soo Line’ was the former Milwaukee Road. Now the principal Canadian carriers cross at grade in Wisconsin, many many miles from the Canadian frontier. Further complicating clarity is that many freights operate with run-through locomotives. In this case CSX 13 (a GE-built) AC4400CW leads a northward CN freight across the old Milwaukee Road. In consist are BNSF, CN and BC Rail locomotives. Try printing all of that on a color slide mount! On January 19, 2019, in a light snow CSX 13 leads a northward CN freight across the diamonds with CP Rail’s former Milwaukee Road at Duplainville, Wisconsin. What to do about the Wires? Sometimes wires can make a photo. Other times these are a nuisance. Here, a modern highway overpass near Marsh siding on Canadian National’s Wisconsin Central line offers a pleasant vista. Exposed digitally using a FujiFilm XT1 with 27mm pancake lens. Unfortunately, high voltage wires running parallel to the road complicate composition. So do you pick someplace else, shoot through the wires, or try to pick an angle that minimizes the visual intrusion of the wires passing through the scene? Les Paul and Whose Train is This?— Or a Wink of Sun. 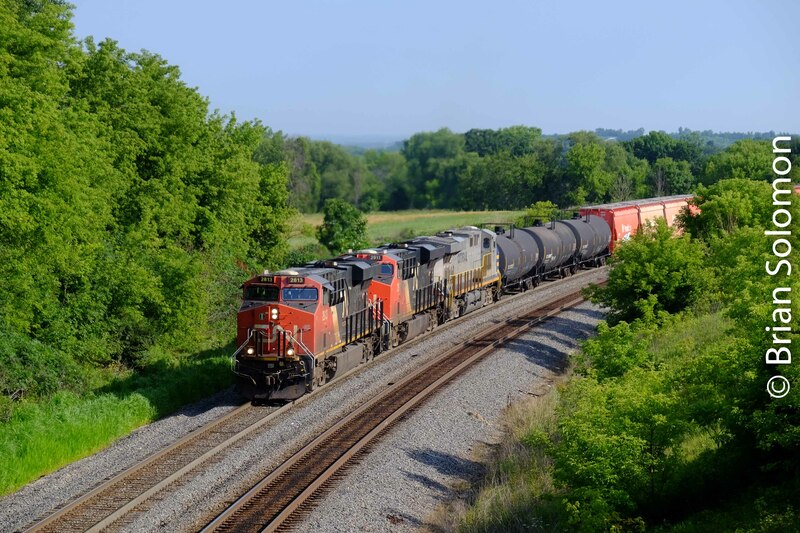 These days, leading locomotives don’t necessarily reflect the operator or even the originator of long distance freights. 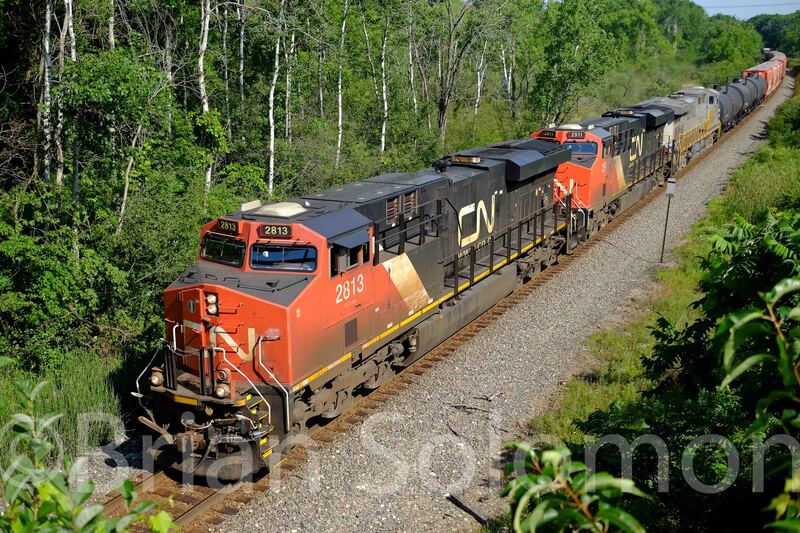 In fact this is a Canadian National train, working the old Wisconsin Central line. Musical legend and an electric guitar inventor, Les Paul was from Waukesha, and here a thoroughfare has been named for him. Its elevated crossing of CN made for nice vistas in both directions. Although it was partly cloudy, momentarily brilliant morning sun made for nice illumination. 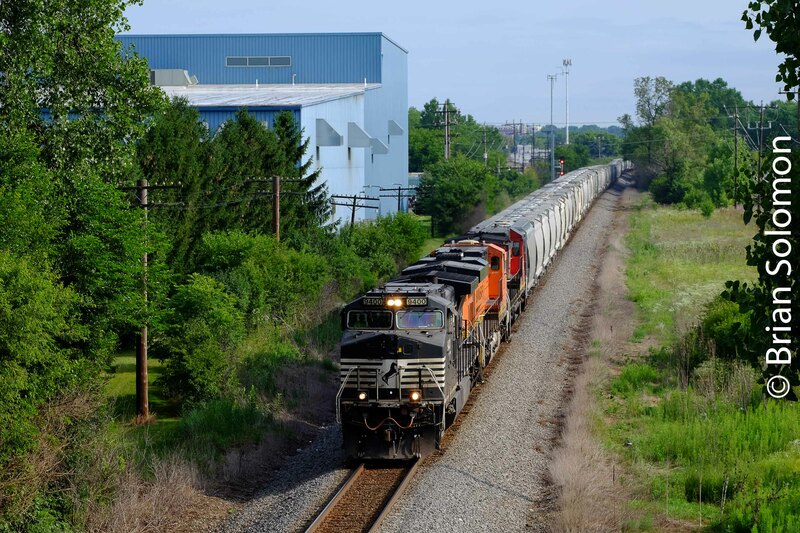 A unit potash train led by Norfolk Southern 9400 rolls along below Les Paul Boulevard in Waukesha, Wisconsin. Notice the old-school code lines to the left of the railroad. Exposed using my FujiFilm XT1 with 90mm lens. Canadian National: Clear aspect on a Clear Morning. 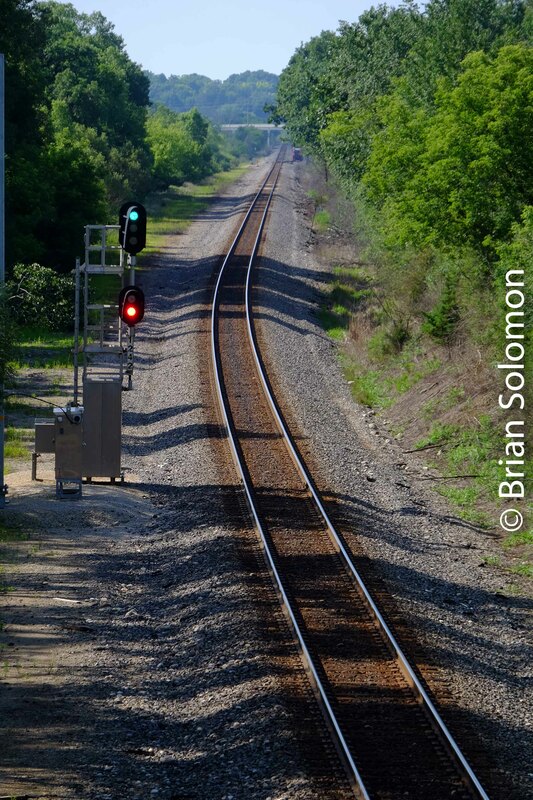 Reading the signals is part of the challenge and joy of my railroad photography. 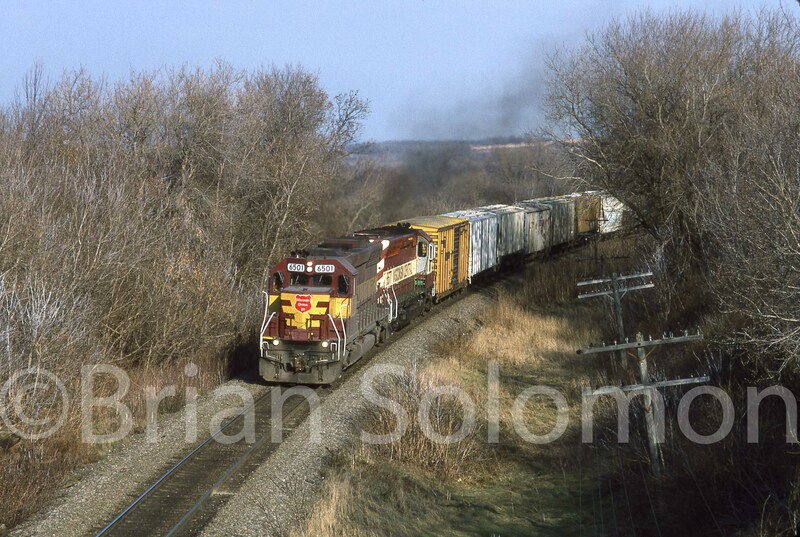 Three weeks back, Chris Guss and I were following a southward Canadian National freight on the Wisconsin Central line. North of Slinger, we made photos from a wooden plank bridge near the north approach signal for Slinger, Wisconsin. This displayed ‘green over red’, in other words a clear aspect. Clear signal at the north approach for Slinger. I made these views with my Fujifilm XT1. After exposing the view of the signal, I changed lenses, and used a 27mm pancake lens for the action photo of the passing train. Canadian National 2813 leads freight M342-41-30 south near Slinger, Wisconsin. On February 3, 1995, Canadian National Railway’s American affiliate Central Vermont Railway ended operations. Shortly thereafter, the newly created RailTex short line called New England Central assumed operation of the former CV route. Since that time, New England Central became part of Rail America, which was then acquired by Genesee & Wyoming. Despite these changes, a few of New England Central’s start-up era GP38s are still on the move in the classy blue and yellow livery. 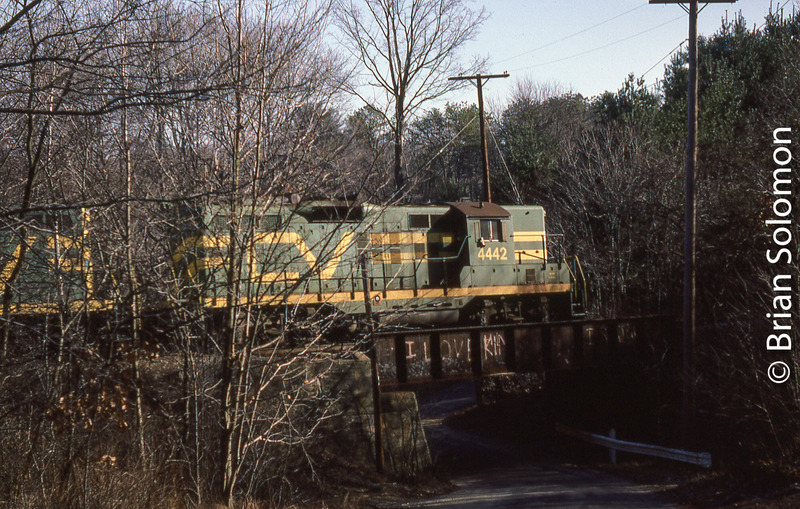 Central Vermont GP9 4442 leads freight 562B upgrade at Maple Street in Monson, Massachusetts on December 23, 1986. New England Central approaches its 23 anniversary. Another view at Maple Street in Monson. Although exposed more than 30 years apart. This pair of ‘then and now’ photos at Maple Street in Monson, Massachusetts, helps delineate my appreciation for New England Central and Central Vermont. Lena, Illinois Follow Up: Mysteries and Questions Resolved. My twin posts focused on Lena, Illinois drew considerable interest and answers. Regarding the monster eastward Canadian National freight; the actual number of cars carried on this one train was 280 (plus three leading locomotives and a lone DPU). That’s a real whopper at 1,144 axles (24 are the locomotives)! A number of Tracking the Light readers wrote to me about the unusual GREX drawbar connected maintenance train. I’ve compiled these below into a brief essay. Dusk view of the GREX Slot Train at Lena, Illinois. The curious maintenance train was built by Georgetown Industries (a spinoff of Texas-based Georgetown Railroad), which uses the GREX reporting marks. This train is described by the manufacturer as a Self-Powered SlotMachine® and commonly as ‘slot train’ which is designed to distribute materials. Instead of conventional gondolas, this is in effect a string of permanently connected articulated gondolas with the ends removed. Since there are no bulkheads between cars an excavator can be used to traverse the entire length to load or unload material. 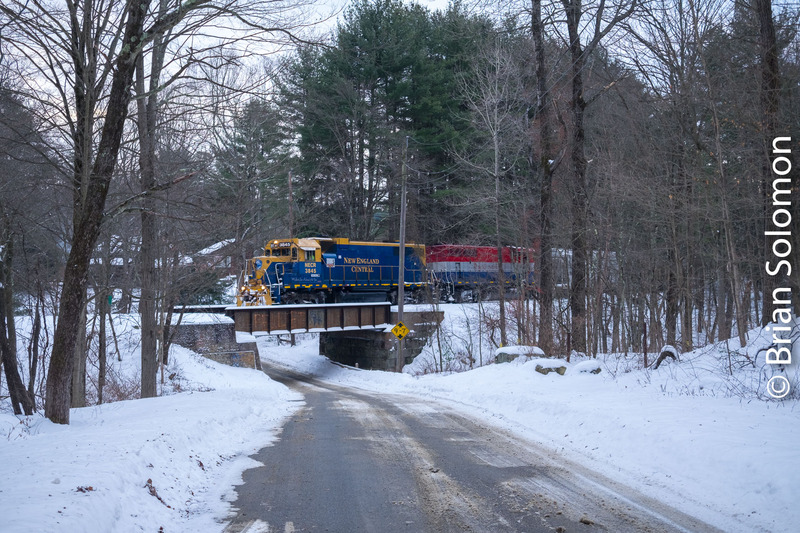 The train is especially useful when a railroad is faced with limited track access time or locations that are inaccessible by road. One application is to dump ballast between the rails on ‘skeletonized’ track. Articulated gons behind the locomotive. One flaw with the train is that the solid draw bar and articulated connections between cars make it impossible to set out a car in case of defect. The Slot train’s power is a relatively new creation and appears to be based on LORAM’S boxy power unit. Georgetown has several Slot train sets that work at various places around the country, the machinery is still being evaluated or leased an as of yet, these trains are a rare sight on American rails. Another Georgetown creation is its Dump Train, which is a series of drawbar-connected hoppers featuring a conveyor belt running under the length of the train and a swing out conveyor belt at the unloading end to deliver aggregate line-side. The style of construction gives the train a nearly European appearance. Meet with the odd-maintainance train.. Surprise at Lena; Canadian National Monster Freight—How many cars?? As noted in yesterday’s post, I’d been inspecting a maintenance train parked on the siding at Lena, when lo and behold, the signal cleared to green. I alerted John Gruber and we took positions to make photographs. So there we were along the old Illinois Central at Lena, Illinois in the fading glow of the evening sun. This had been IC’s line from Chicago via Dubuque to Council Bluffs, Iowa and Back in the mid-1990s it had been operated as a regional called the Chicago, Central & Pacific, before being re-incorporated into Illinois Central on the eve of IC being absorbed by Canadian National. Looking west on the old Illinois Central. Fuji film X-T1 photo. John Gruber (at left) is poised to capture the action. A headlight twinkled into view, and I could see that a freight was coming, but not very fast. As it grew closer I had the innate sense that it was a really huge train. This was a real monster! A land-barge. Just simply huge. Eastbound at Lena, Illinois in the fading evening light. Meet with the odd-maintainance train feature in yesterday’s Tracking the Light. I’ll let you in on a secret: I counted the cars. And do you know what? This was the largest/longest train I’d ever seen on the move. That’s with more than 40 years of watching trains. Any guesses as to how many cars? Trust me, it was a doosie! The answers will be revealed in an up-coming post! Surprise at Lena—I wasn’t expecting this (and more!). A few weeks back, John Gruber and I were on our way back to Madison, Wisconsin from the Mississippi River Valley. We’d followed the old Milwaukee Road up to Lanark, Illinois, then cut northward on Illinois State highways. The sun was a golden globe in the western sky above rolling corn fields. At Lena we intersected Canadian National’s former Illinois Central east-west line that connects Chicago with Council Bluffs, Iowa. I noticed that the signals were lit red and that there was something unusual in the siding. Unusual indeed! It was a self-propelled draw-bar connected train of articulated flatcars for maintenance service. I’d never seen anything like it. I’d love to tell you all about it, except I know precious little, except that the ‘locomotive’ had EMD Blomberg trucks and the whole machinery carried GREX reporting marks. Perhaps if I do another book on railroad maintenance equipment, I’ll have the opportunity to research this train more thoroughly. This is one curious looking train. Exposed with my FujiFilm X-T1 with 18-135mm lens. Look ma, no couplers! That’s a straight drawbar connection between the locomotive and cars. Unusual in American railroad practice. Trailing view of the locomotive. Look! There’s a headlight on the horizon. . . . While I was studying this unusual railway machine, the eastward signals at the end of the siding changed aspects; the cleared from all red to ‘green over red.’ A train had been lined! Hooray! Canadian National near Stratford, Illinois. It was a clear Spring day; Mike and Tom Danneman and I had departed Waukesha, Wisconsin before sunrise aiming for Rochelle, Illinois where Chicago & North Western crossed Burlington Northern’s C&I Line. At 7:46 am we photographed our first train, a C&NW eastbound crossing the diamonds at Rochelle. By 10 am we’d caught six trains between the two lines and had worked our way east on BN. At 10:47, we picked up a Canadian National freight working westbound on BN. At the time CN was routing 4-5 trains each way daily over BN between the Twin Cities and Chicago. We followed this CN freight led by a pair of General Electric cowl type diesels (model DASH8-40CM numbers 2416 and 2440). At 11:57 am it met an eastward CN freight near Stratford, Illinois. Exposed on Kodachrome 25 at f5.6 1/250 with a Nikon F3T fitted with 35mm PC lens. I was working with two cameras. In my Nikormat FTN I had Fuji Provia 100, and in my Nikon F3T Kodachrome 25. We continued our chase went toward Savanna, catching this train again at 1:36pm near Burke, Illinois. By the end of the day we’d photographed 21 freights. Not bad for a day out. Looking down from the CN Tower on Canadian National’s Spadina Roundhouse in Toronto. I exposed this vertigo inducing view from the sky-reaching CN Tower using my Leica 3A with 50mm Summitar and Kodachrome 64. It was a glorious clear morning and I was visiting Toronto for the first time. After the tower, I wandered around on the ground making a few select images. While the nearby Canadian Pacific roundhouse at John Street survives as a museum, CN’s Spadina Street was demolished a year after my visit, and almost everything in this view has been erased from the scene. What’s Around the Bend or Over the Horizon? Cumbres & Toltec former Denver & Rio Grande Western three-foot gauge line, Colorado. Railway tracks are the defining infrastructure of this transport system. They are key to the whole technology as well part of the title of this Internet Blog. Often, tracks are view as secondary to the trains that use them. Photographs tend to focus on the locomotives and cars, rather then the tracks themselves. With this post, I’ve focused on the tracks. I’ve selected a few photographs from my archives in which the tracks are the subject: tracks leading to the horizon across a desolate desert landscape; tracks curling around a bend in the snow; tracks in the weeds and tracks catching the sunlight. Tracks capture our imaginations, and the images of tracks can be timeless. Yet not all tracks are the same. The condition of the line and nature of the landscape is telling. I’ve made hundreds of images like these over the years; sometimes from trains, other times from the ground, or overhead bridges. The formula is simple, but the results vary greatly. Often the thought of what lies beyond is the most intriguing. What lies around the curve or just over the horizon? It are images like these that inspire wanderlust for railway journeys. In days of yore, how many young men left home in pursuit of that the elusive view around the next bend in the tracks. Cape Breton & Central Nova Scotia’s former Canadian National Railways trackage. Dandelions on the line; PKP tracks near Grodzisk, Poland. Canadian National crossovers at Bayview Junction, Ontario. Maine Central tracks at Lincoln, Maine. Derilict former Santa Fe sidings at Streator, Illinois on BNSF Railway. This was Once an Eight Track Mainline. And there are still six tracks, but now it is in effect two parallel lines; a four-track electric suburban route run by Chicago’s Metra, and a double track line run by Canadian National. On November 7, 2013, Chris Guss gave me a whirlwind tour of Canadian National operations in Chicago, largely focused on former Illinois Central lines. Canadian National’s 33891 rolls southward on the former Illinois Central at East Pershing Street in Chicago on November 7, 2013. Exposed with a Canon EOS 7D fitted with an f2.0 100mm lens. We scoped this location on East Pershing Street south of downtown, knowing that Canadian National’s southbound freight from Waterloo, Iowa (symbol 33891) was on its way. We didn’t wait long before it came into view. In the course of about 25 minutes, we caught the freight followed by a wave of passenger trains run by Metra, South Shore and Amtrak. The old Illinois Central catenary adds an element of intrigue to the gritty atmosphere of this line. While waiting for trains, an enthusiastic baker came by and offered us butter cookies. Tasty too! I exposed photos with three cameras, working with both my Canon EOS 7 and Lumix LX3, plus my Dad’s Leica M4. During out short visit the sky over Lake Michigan quickly changed from blue to gray, a weather condition all to typical of Chicago. One of Metra’s 1970s-era Illinois Central electric EMUs comes zipping along under wire. Chicago’s distinctive skyline looms in the distance. This view was made from East Pershing Street, Chicago on November 7, 2013. Exposed with a Canon EOS 7D fitted with an f2.0 100mm lens. South Shore train on the former Illinois Central at East Pershing Street in Chicago on November 7, 2013. Exposed with a Canon EOS 7D fitted with an f2.0 100mm lens. Amtrak 390 roars northward on the former Illinois Central at East Pershing Street in Chicago on November 7, 2013. Exposed with a Canon EOS 7D fitted with an f2.0 100mm lens. What happened to Illinois Central? See my new book North American Railroad Family Trees for evolutionary discussion of the North America rail network. Metra Electric; Chicago, Summer 1996. The maelstrom of 1980s-1990s mergers and spin-offs left very few railroads untouched; in this dramatic re-drawing of the railway map, some roads, such as CC&P, have been nearly forgotten. Chicago Central & Pacific: there and gone. Eighteen years ago today, May 20, 1995, I made this image of a CC&P former Illinois Central GP9 (still wearing pre-Illinois Central Gulf, IC black) working across the Burlington Northern crossing at East Dubuque, Illinois. For me, this image of a train emerging from the inky depths of a leaf-covered, stratified cliff, crossing another set of tracks and reaching out of the frame, neatly sums up the short history of the CC&P. During the mid-1980s, Illinois Central Gulf dramatically trimmed its route structure. Among the lines carved out of ICG, was the Chicago-Omaha/Sioux City CC&P. Born at the end of 1985, this ambitious regional line competed for east-west traffic on the its Chicago-Omaha trunk, while serving on-line customers. After a little more than a decade, Illinois Central (by it then had dropped the ‘Gulf’ in its name—adopted as a reflection of the early 1970s merger with Gulf, Mobile & Ohio) reacquired CC&P. During the relatively short interval of CC&P independence, the railroad never re-painted all of its locomotives, many of which had been in inherited from ICG. Shortly after, CC&P was melded back into the IC family, it too was absorbed by Canadian National. At the time of this photo, CN was actively using trackage rights on BN, and its trains crossed CC&P’s line 8 to 10 times daily. Railroad Family Trees Coming Soon! My book, tentatively titled Railroad Family Trees will be available from Quayside Publishing Group later this year.